Asus Zenfone Max Pro M2 vs Redmi Note 6 Pro which is the best choice for you. Asus Zenfone Max Pro M2 launched in India 2018, 11th of December. The new Asus phone will get a tough competition from the recently launched Redmi Note 6 Pro in India. Explain that Asus is giving tough competition to Xiaomi in the mid-range segment. Asus Zenfone Max Pro M2 and Xiaomi Redmi Note 6 Pro how they compete for each other in terms of specifications. 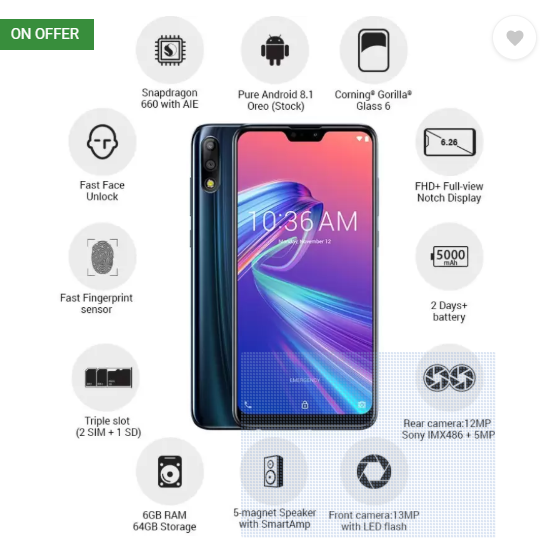 In India, the price of Asus Zenfone Max Pro M2 3GB RAM / 32GB storage variant is priced at Rs. 12,999, while the price of 4 GB RAM / 64GB storage variant is Rs. 14,999 and 6 GB RAM / 64GB storage variant Rs. 16,999 respectively. At the same time, the 4G RAM / 64GB storage variant of the Redmi Note 6 Pro is priced at Rs. 13,999 and the 6 GB RAM variant is priced at Rs. 15,999. Asus Zenfone Max Pro M2 has 6.3 inches (2280 × 1080 pixels) FullHD + display. The aspect ratio of the screen is 19:9. Corning Gorilla Glass has been provided for safety. There are 6.26 inches (2280 × 1080 pixels) Full HD + screen with Radmi Note Pro 6, which has an aspect ratio of 19:9. The phone has a 2.5 de-curved glass display and Corning Gorilla Glass Protection. The Asus Zenfone Max Pro M2 features the Adreno 512 GPU for the Octa-Core Snapdragon 660 mobile processor and graphics. At the same time, Radmi Note 6 Pro has given the Adreno 509 GPU for 1.8 GHz octa-core Snapdragon 636 processor and graphics. The Asus Zenfone Max Pro M2 smartphone is available in 3 GB RAM / 32GB storage, 4GB RAM / 64GB storage and 6GB RAM / 64GB storage variant. Increase the phone's storage via microSD card to 2 TB. At the same time, Redmi Note 6 Pro offers 6 GB RAM and 4 GB RAM options. The phone has 64 GB inbuilt storage, which is possible to be enhanced through microSD card up to 256 GB via microSD card. Asus Zenfone Max Pro M2 runs on Android 8.1, while Xiaomi Redmi Note 6 Pro Android 8.1 runs on Oreo-based miui 10. Both handsets have features like a fingerprint sensor and face unlock on the rear. Asus Zenphon Max Pro M2 has 12-megapixels primary and 5-megapixel secondary sensor with aperture F / 1.8, PDAF, EIS and LED flash. The phone has a 13-megapixel front sensor with LED flash and aperture F / 2.0 for selfie and video calling. The phone has a 12-megapixel primary sensor and 5-megapixel secondary sensor with aperture F / 1.9, dual-pixel autofocus, EIS and dual-tone LED flash for photography. In front of the phone, a 2-megapixel depth sensing secondary setup with aperture F / 2.0 with 20-megapixel primary and aperture F / 2.2 has been given. 5000mAh battery is given to give power to the Asus Zenfone Max Pro M2, while the Redmi Note 6 Pro has a 4000mAh battery with a higher capacity, which makes Quick Charge 3.0 sorts.